StencilGirl Talk: Set sail and fly into art with new stencils by Mary Nasser and Andrew Borloz! 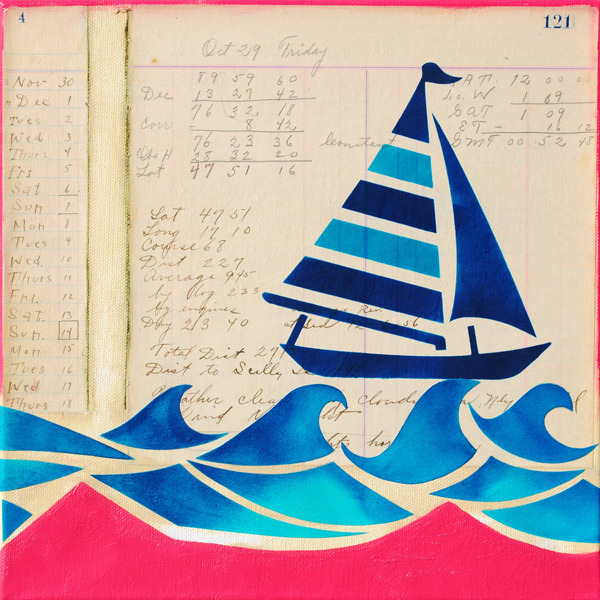 Set sail and fly into art with new stencils by Mary Nasser and Andrew Borloz! 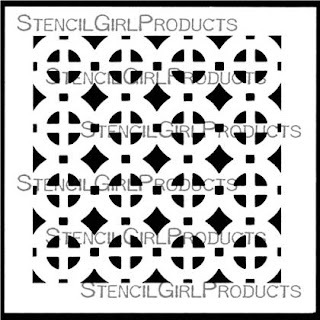 Be sure and scroll all the way through this post because StencilGirl® is introducing 10 new stencils for your art making pleasure! 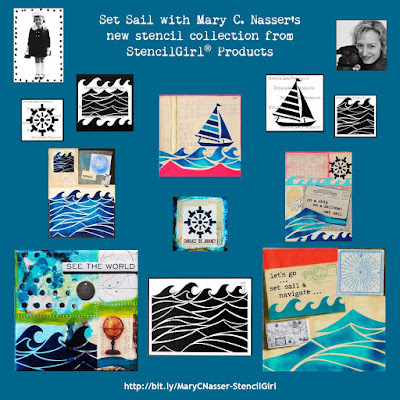 Mary Nasser has sailed right into February and you can hop aboard with her new stencils. Andrew Borloz finds fascinating stencil inspiration everywhere he looks. 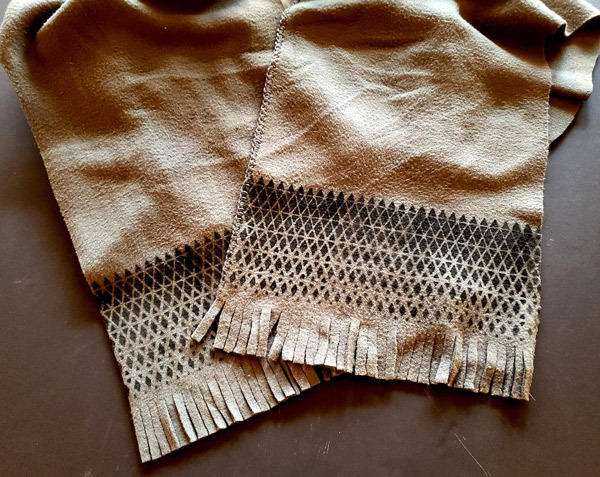 He's put his own interpretation on objects as diverse as Pacific Northwest Tribal Art, bobbins, blankets, birds, barbed seeds, and a paper cutting. 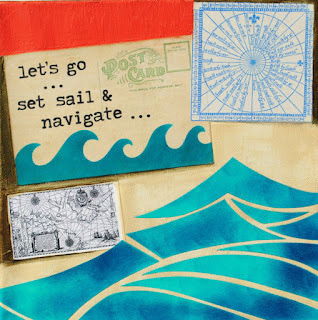 "This new Set Sail stencil series was inspired by my love of water, waves, and time spent traveling on the oceans and seas. I’ve been having such fun incorporating these into my new body of paintings on stretched canvases and gessoed watercolor paper collaged with 1920s ledger paper from a Sea Captain documenting his ship's travels, bits of black and white maps, vintage papers, ephemera, and postcards, too. 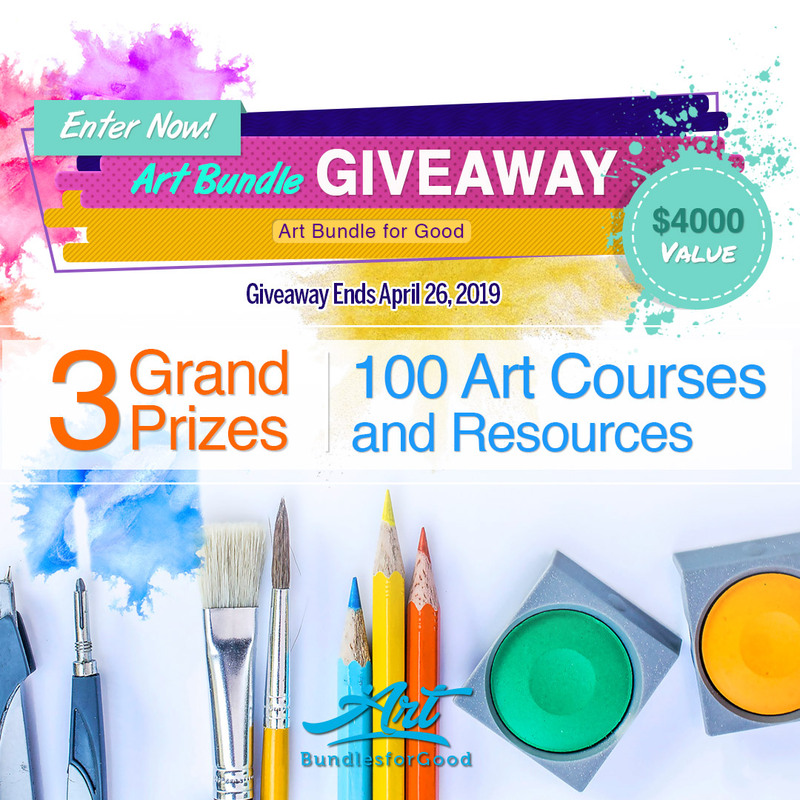 I continually reached for my blue StazOn inks and Emerald Creek embossing powders during the process of creating these artworks. The Set Sail stencil series includes 5 designs: Navigate, Sailboat, Mini Waves, Water’s Edge, and Making Waves." 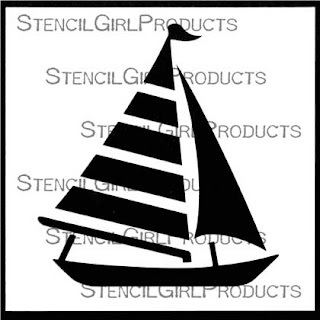 Embark on a journey in your art with Mary’s Sailboat Stencil! 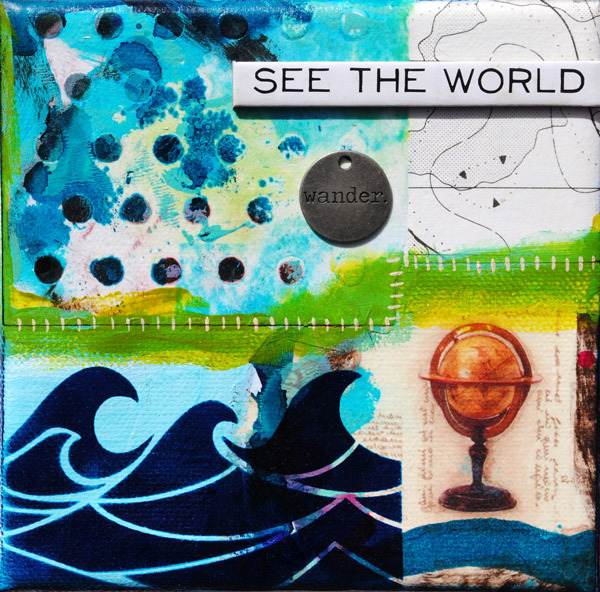 At 6" x 6" it's just the right size for your artistic voyage. 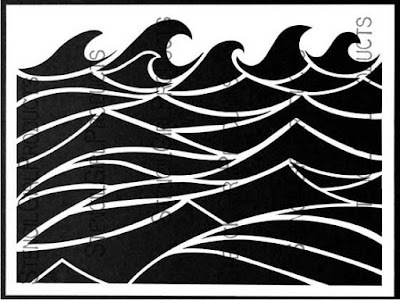 The abstract design of the waves Mary created in her 9” x 12” Making Waves Stencil makes it great for adding rhythm, movement, and patterns to your art. 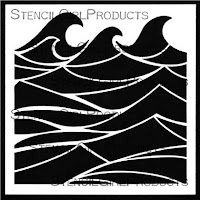 The 6" x 6" Waters Edge Stencil incorporates a mask of waves built into the top edge of the design and a stencil of waves cut from the bottom edge. 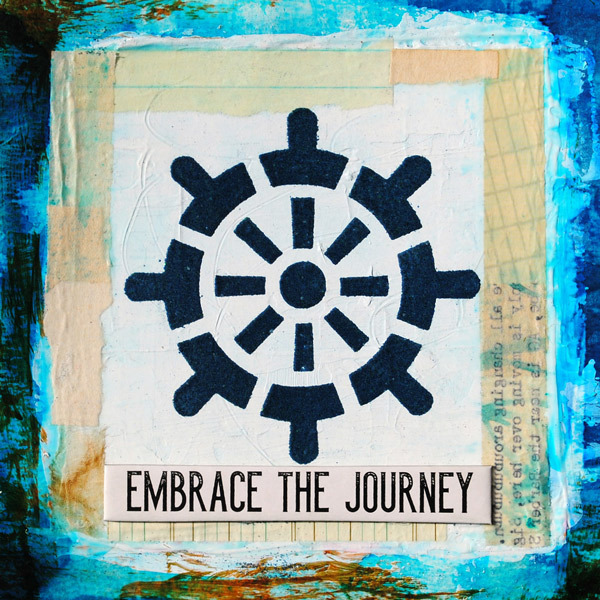 Mary's Navigate Stencil was inspired by the shape of a ship’s wheel. 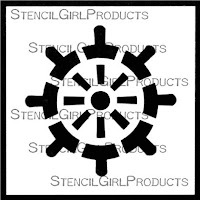 This 4" x 4" stencil is ready to steer your art through mixed media canvases to art journals. 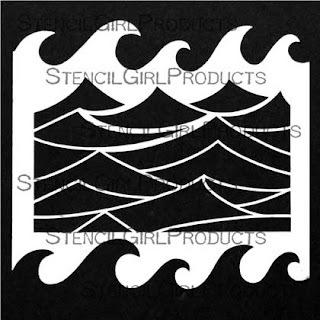 Add rhythm, movement, and patterns to your art journal pages, mixed media projects, card-making, tag art and more with this delightful 4" x 4" Mini Waves Stencil. "I used to travel a lot and have gone to Pacific Northwest where I saw many fine examples of Pacific Northwest native art. I also have seen totem poles in museum settings and in books. 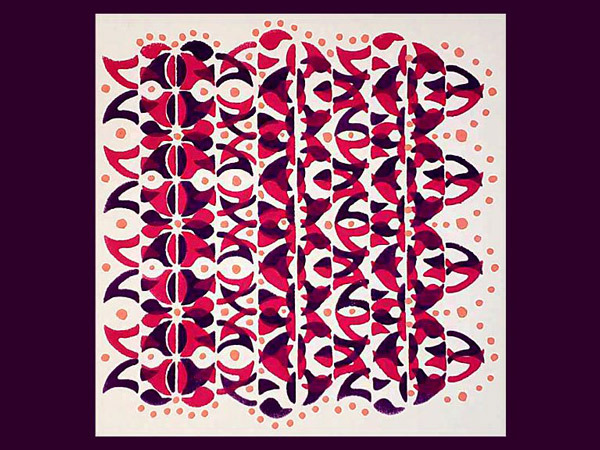 I love the simplicity of the abstract designs representing various mammals, fishes, and birds. I created this design using paper-cutting techniques and came up what it looks like two birds in one piece. 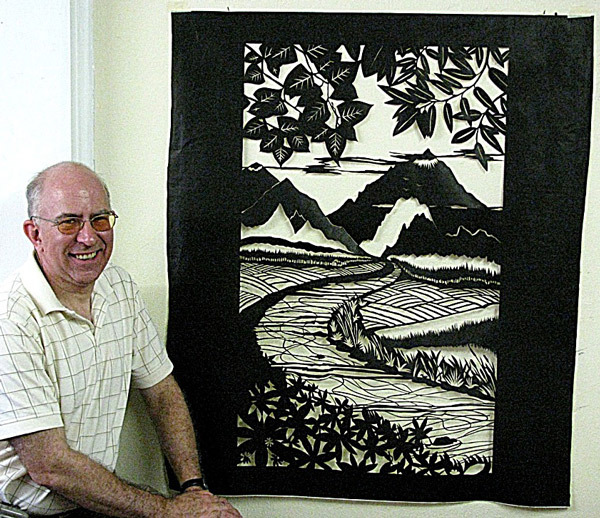 It also utilizes the Japanese design concept of "notan" that incorporates negative & positive shapes created from cutting black paper and pasting down cut pieces. 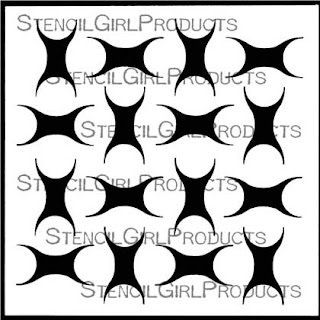 I then digitally repeated one basic "logo" to create an overall pattern." "I often look inside of home appliances for design inspiration. During the summer of 2018, I was upcycling the khaki/chino fabric cut from my well-worn pants, and I was learning how to use the sewing machine that my mom owns. I looked at the bobbin holder and saw the "plus" and notches. 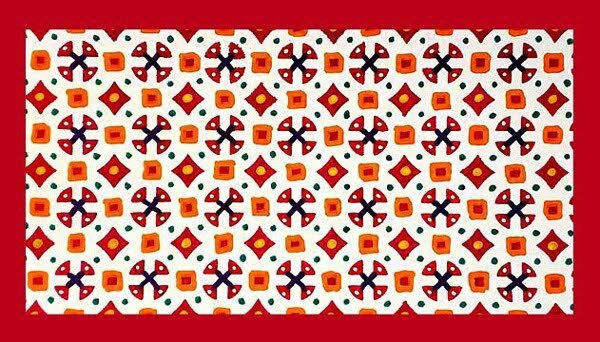 So, I thought about combining three shapes to create this pattern: washer, notch and plus. 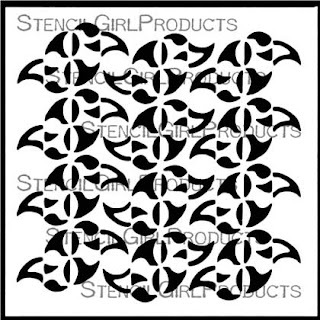 This design can be used to make decorative fabric for pillows or even quilt squares. It also can be used as backgrounds for art journaling or mixed media projects." 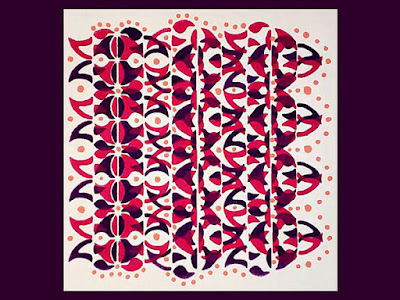 "I have been fascinated with decreasing/increasing sizes of shapes like Ben Gay dots and halftones. For example, dots were often used in halftone printing techniques to give depth, shades, and shadows. 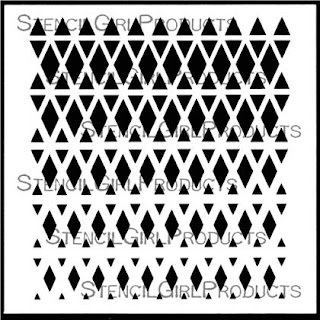 The triangle and diamond shapes that were often used on Native American blankets also inspired me to create this design using the halftone technique with triangles instead of dots. 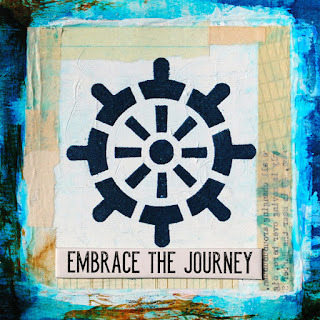 The stencil design gives one an opportunity to create gradient effects on the art journal page or fabric." 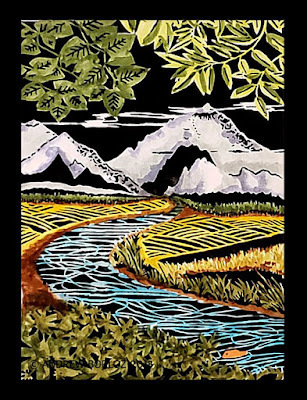 "When I was younger, I often walked through the woods in the fall, and sometimes, my white socks would catch several dark-colored barbed seeds. These seeds had two barbs on one end, but I thought that putting the barbs on both sides would make it look more balanced. After I created the basic design, I thought it looks like something else that I have seen only in photographs but couldn't remember the name. Someone said that they looked like shark eggs (also known as "mermaid purses") and even though I have made many scuba dives, I have never come across them. 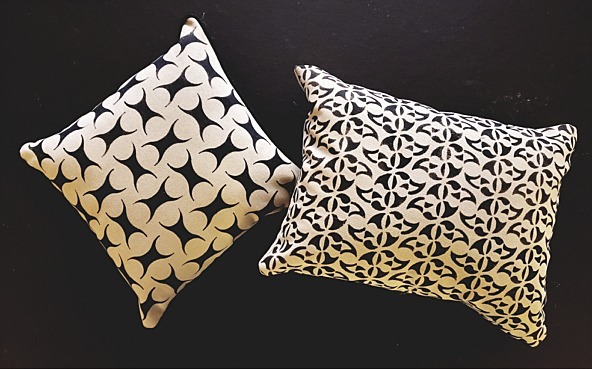 The design that I created is simpler and thinner than the actual shape of the shark eggs, and I thought the stencil name, Rectangular Pods, is a fitting one for this pattern." "I have taken several paper-cutting classes in various locations, and I was challenged by one instructor to create a large paper cutting. 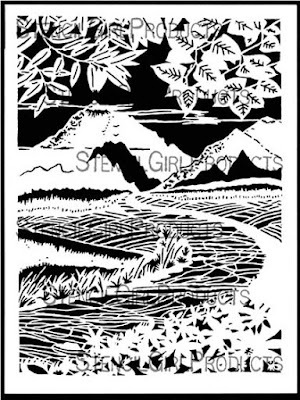 I decided that I would use elements often found in Japanese prints such as mountains, tall reeds, river, and clouds, to name a few. The original size of the cutting was about three feet wide by six feet high, and I have reduced the overall size to fit in 9'x12" stencil." 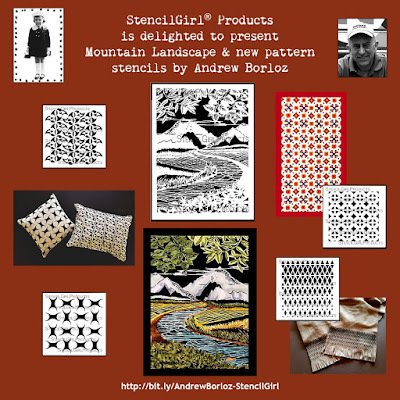 You can get Mary Nasser's stencils here, Andrew Borloz' here, and all the latest stencils right here. 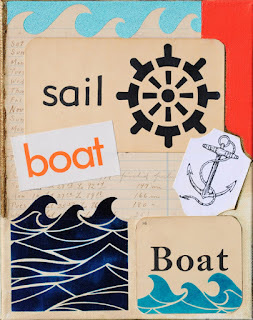 I like the nautical theme. Great use of the stencils.